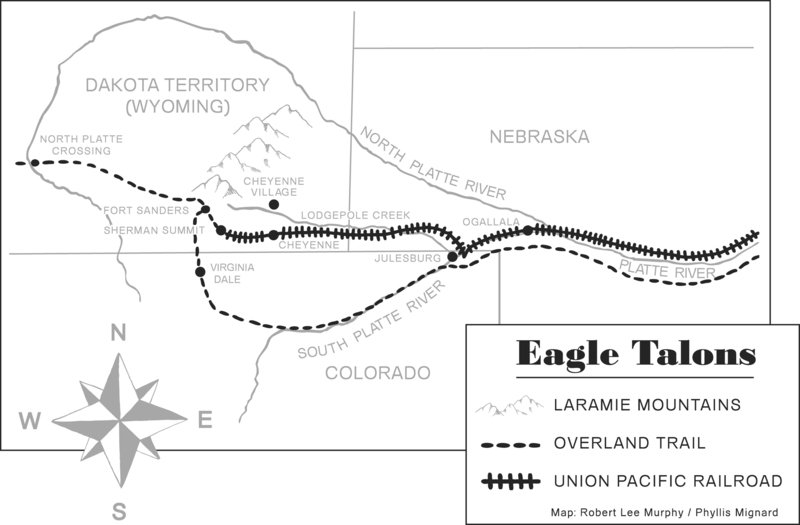 The action in Eagle Talons, The Iron Horse Chronicles–Book One, takes place predominately in southeastern Wyoming (when it was still part of the Dakota Territory) and northeastern Colorado. Will Braddock starts his quest from his birthplace in Burlington, Iowa. He passes through Omaha, Nebraska, in his search for his uncle, Sean Corcoran, where he seeks the aid of the Union Pacific’s chief engineer, General Grenville Dodge. After traveling on the new transcontinental railroad westward to the Hell on Wheels town of Julesburg, Colorado, his adventures continue throughout the countryside depicted on this map. As a reader, I enjoy having a reference map of the locale where the story occurs. Five Star Publishing did an excellent job of including such a map as a double-page spread in Eagle Talons. The credit for producing the finished map goes to Phyllis Mignard, my friend and fellow member of the Las Vegas Word Worms’ critique group of the Society of Children’s Book Writers & Illustrators. From my crude sketch, Phyllis produced this artistic map that helps the reader visualize where Will Braddock is seeking to determine his own destiny. Publication is only ten days away, October 22, 2014. There is still time to pre-order Eagle Talons from either Amazon or Barnes & Noble at a savings. Use the links in the sidebar. This entry was posted in Eagle Talons - Book One, Geography, Iron Horse Chronicles' Characters, The Iron Horse Chronicles, Transcontinental Railroad, Union Pacific and tagged Adventure Fiction, Eagle Talons, Fictional Character, First Transcontinental Railroad, Five Star Publishing, Frontier Fiction, Grenville M. Dodge, Historical Fiction, Historical Personage, Pioneer Life, SCBWI, Teen Fiction, The Iron Horse Chronicles, Will Braddock, Young Adult Fiction, Young Readers. Bookmark the permalink. I can’t wait for my copy to arrive. My order has been confirmed, I’m just anxiously waiting for the delivery.